Perhaps the single drawback to the space I rent for my studio is that the lighting is pretty crappy. Ceiling-mounted banks of fluorescent lights, some of them encased in opaque plastic shades. Ambient, but lousy for precise, up-close-and-personal tasks. I have an excellent floor lamp by my knitting/writing/handwork chair, and good task lighting on my work table. 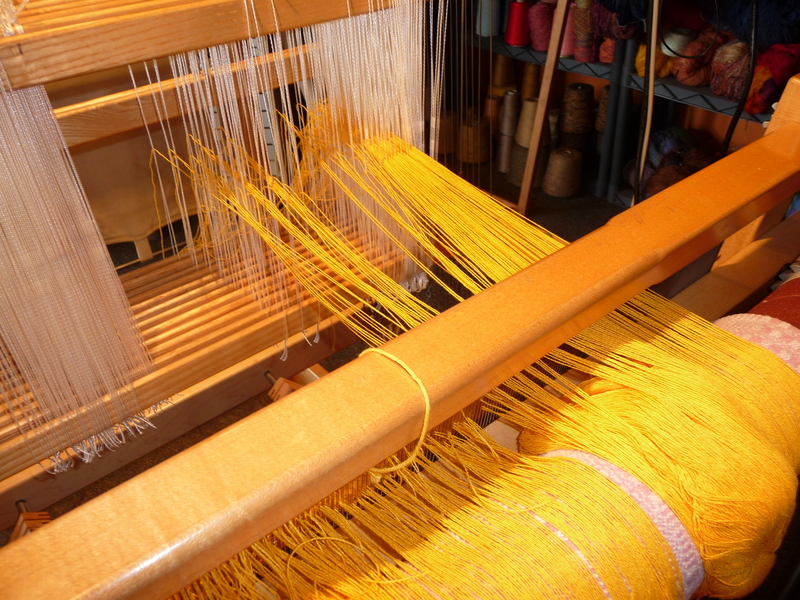 On my looms? Not so much. Until now . . . .
See those two silvery cup-shaped thingies at the ends of the wavy wands? Lights! With bright halogen bulbs inside. These fixtures were given to me some time ago by my sculptor friend Sharon Spencer, and stashed in my storage closet with no further examination. What was I thinking? 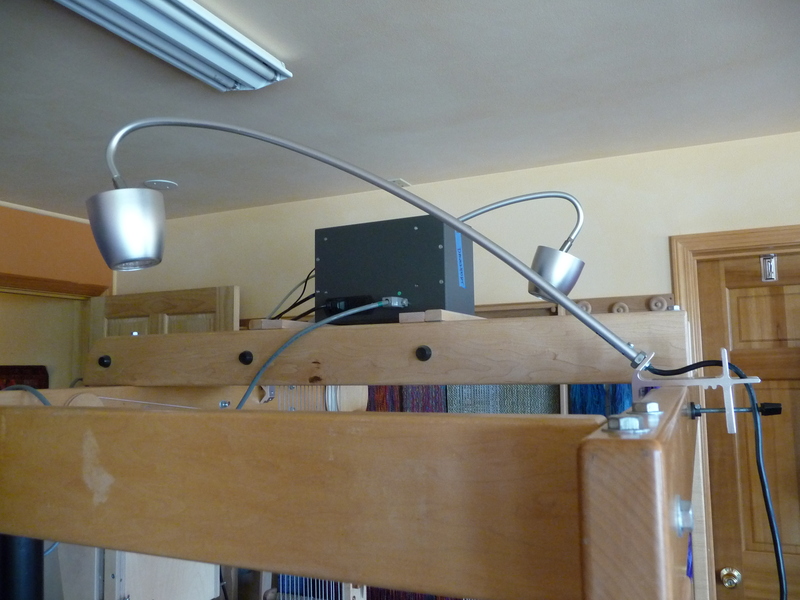 I’ve struggled for far too long to be able to see clearly when threading Sally, and finally this week I asked my landscape designer friend Fran Abel to help me attach these lights to the loom. We did, and I performed a little happy dance as soon as they were turned on. See how beautifully they light up my work area? This sideways angle shows you that marvelous shadow! I’ve never seen a shadow like this on my to-be-threaded warp! It’s the indicator that there’s actual bright light falling down onto it. 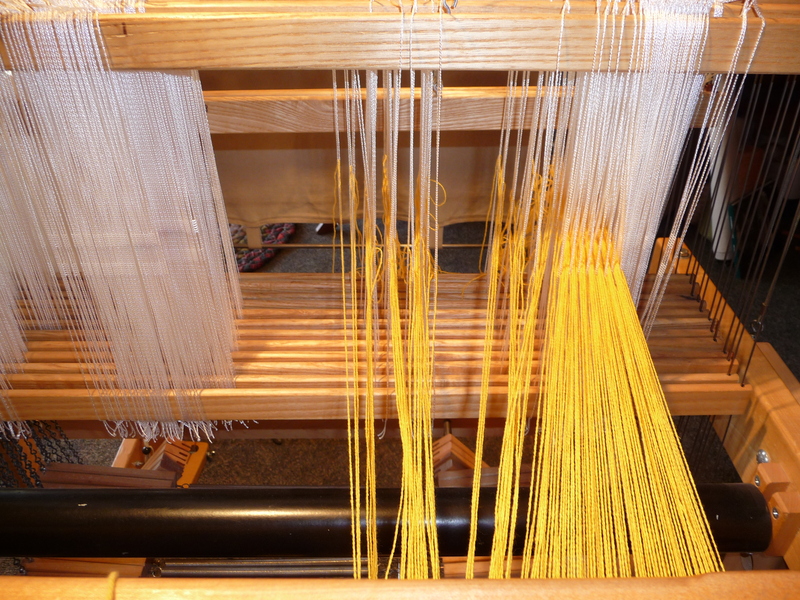 And looking straight into the area where I thread each skinny (in this case) warp thread into the eensy eye of a heddle (those white doohickeys), the light is bright and clear. I can see easily to do this long, slow, tedious task. Big sigh of relief and pleasure. Well, I did wonder, but didn’t think to ask, how come there wasn’t better illumination over the work area. Now I needn’t ask. Yay for the light!